Bio: Nicora Gangi was born in Indiana in 1952 and was educated at Hartford Art School, Hartford, Connecticut, Montclair State College and Syracuse University, where she was awarded her BFA in 1974 and her MFA in printmaking two years later. Nicora Gangi still resides at Syracuse, where she has been a part time faculty member of the university for thirty years. 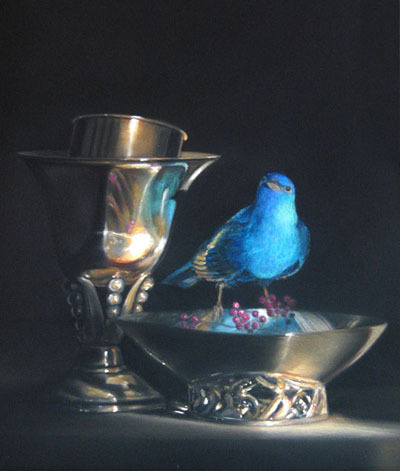 She won the Pastel Journal Grand Prize in 2005. Navigation: Easy. Main menu remains available at all times. The site is entirely constructed in Adobe Flash Player 10. This can be irritating as the viewing area keeps being re-sized, depending on what’s being viewed. Image View: Small thumbnails to the left of the page open in the viewer when clicked. The mechanism is Adobe Flash Player 10, so images cannot be downloaded directly. Enlargements give details of dimension and date of original. Curiously, there is a right click, print option which if implemented will print the current enlargement and the thumbnails. This option is likely to use a lot of ink, as Ms. Gangi’s paintings are full of colour. “My paintings hark back to the Middle Ages and the Renaissance,” says Gangi, “when colours had definite meanings for people who weren’t literate. Red was associated with blood, the passion of Christ; blue connoted the heavens; yellow or gold, divinity – colour is part of the story-telling nature of my work.” You can read the full piece in the April 2005 issue of the Pastel Journal.